Today is National Swap Idea Day! Didn’t you know that?? :D Well we knew and we decided to commemorate it by throwing together a blogger swap with some of our favorite DIY girls from around the web. Amazing right!? 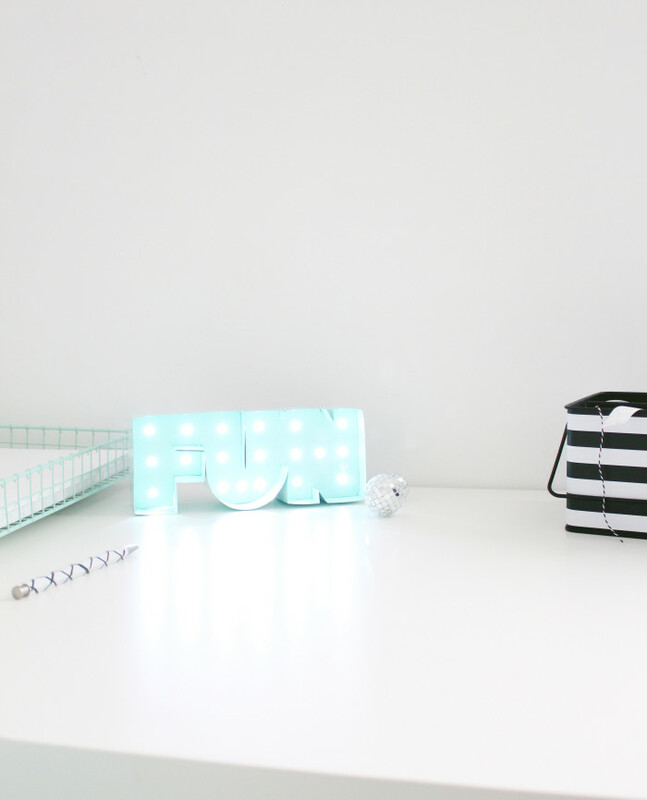 Well since we got to come up with a fun project, send it to a blogger we highly admire AND we received a fantastic project to keep and display on our desks, we sure think it’s pretty amazing! This is only the first in what we hope to become a quarterly blogger swapping collaboration! 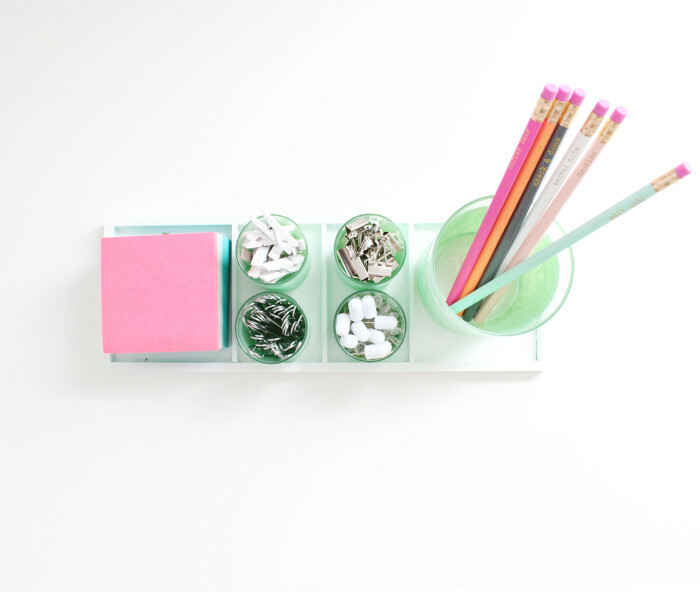 Each swap will feature a theme and for our first one we chose desk accessories/office supplies and organizing tools. I may have been leaning towards that because I felt like my desk really needed some accessories and organizing help. 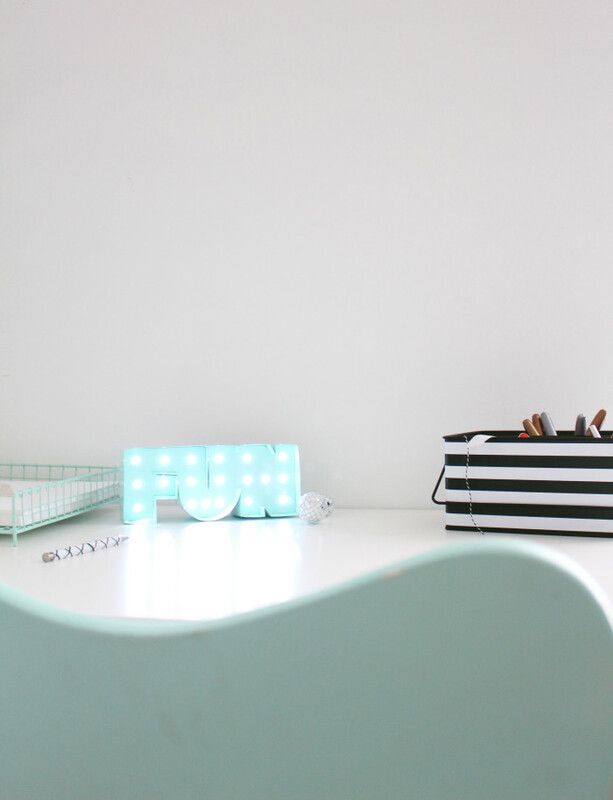 Call it manipulative but I DON’T CARE because I got the most perfect thing back from Christina of Christina Williams Blog and it has completed my desk, nay I say my life! 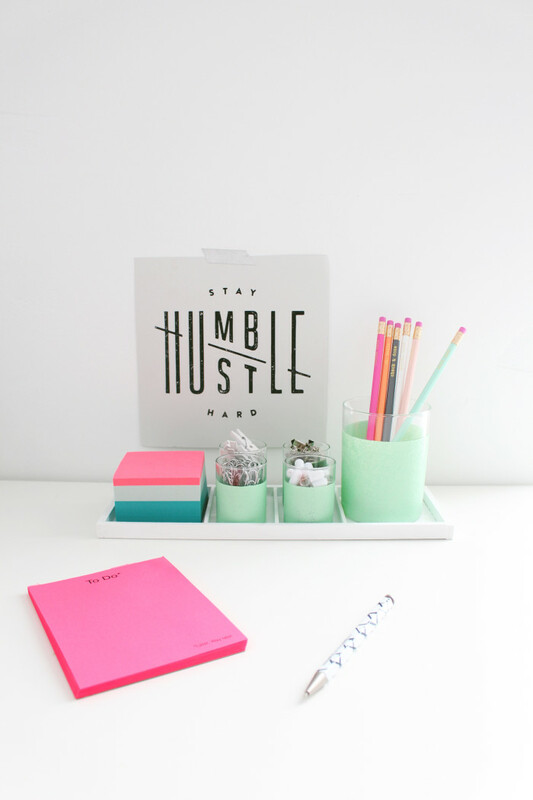 Isn’t this desk caddy so nifty?! 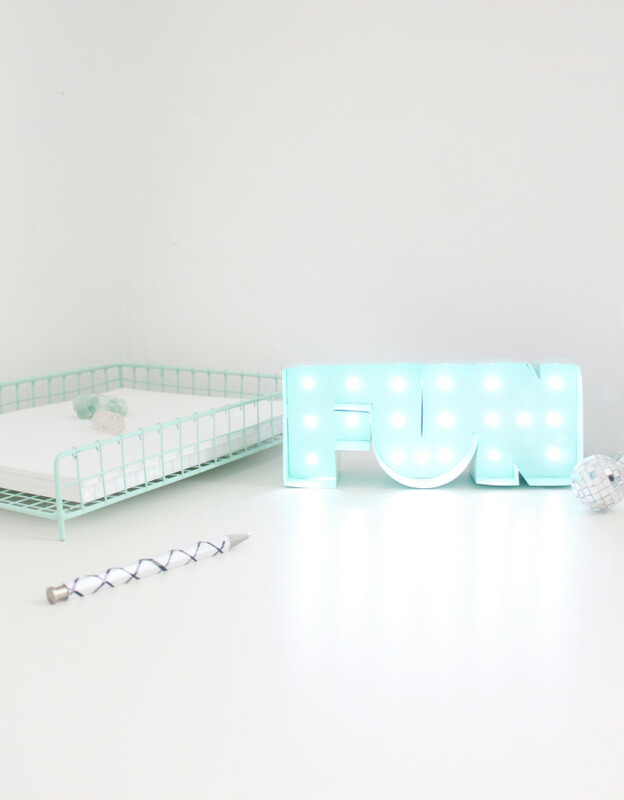 I love how each little glass fits perfectly in it’s spot and is filled with cute and necessary items and I OBVIOUSLY love the mint color, it’s perfect for my space! Can you believe I had no push pins?? Seriously! I didn’t own one and I often need them so I couldn’t be happier that I now have so many! I think a cork board DIY may be in my near future.. I love Christina’s project, I love that I get to keep it and I love all the other amazing projects the other bloggers came up with! Head on over here to get Christina’s DIY and then visit the rest of these awesome ladies projects and follow along with their blogs and instagrams, you will NOT regret it! My project may not be as useful as the one I received but I just hope Sara didn’t need any push pins! haha! I think this little marquee light came out super cute and, for me, it’s important to have whimsical pieces around my work area that keep me motivated and inspired so I hope Sara gets that out of this piece. This was super easy and with all the holiday lights hitting store shelves you shouldn’t have a hard time completing one yourself! Yours can say whatever you want but I provided the template for the word fun if you want to do one just like ours. Click through for the full how-to! And make sure you visit the rest of these awesome ladies’ blogs and projects! 1. 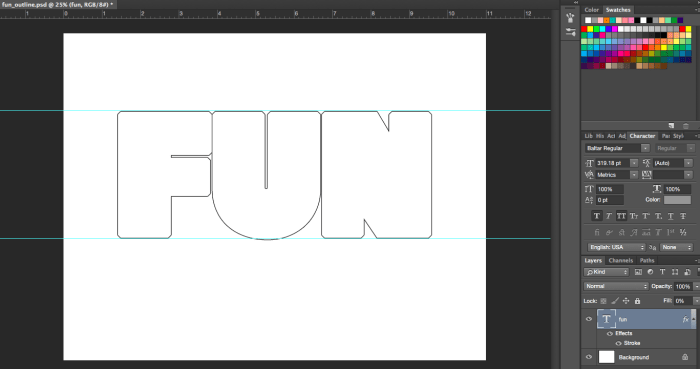 I made the word “fun” and the template for that is available here. But you can make any word you want. This screenshot shows how I made it. I basically picked a super bold font, decreased the space between each letter, resized them to the size I wanted (3″) and then changed the fill to 0% and gave it a 5 pt black stroke. 2. Print out your word and cut it out.Make sure you leave all letters connected. 3. Trace this word on to your foam board. 4. Cut this out with a utility or xacto knife. 5. Mark where you want your lights to poke through. I got my lights at Big Lots, they’re a battery powered and a strand of 20 so you need to make sure you’re only making as many holes as you have lights. I basically made a grid on my word and made holes where the grid intercepted. There were three holes down on each vertical part of the letters. 6. Poke through to create your holes. I used the tip of my mechanical pencil for this and it was perfect. I poked until I felt it just stick through the other side then poked through the back as well. 7. 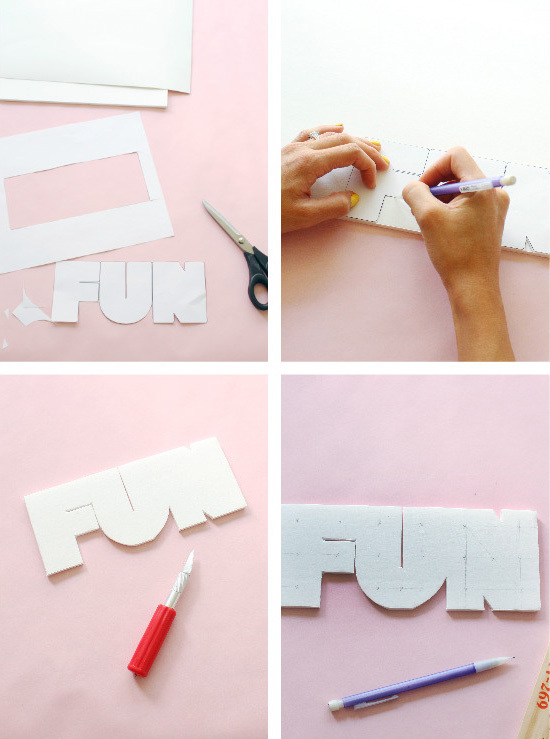 Cut strips from your poster board. Mine were 2″ wide. 8. You will want to score your folds to get super neat creases since this light is so small. You don’t necessarily need a tool for this, you can makeshift your own. Hold your strip up to your word and then mark with a pencil where it needs to fold. Score this mark and then fold along it. 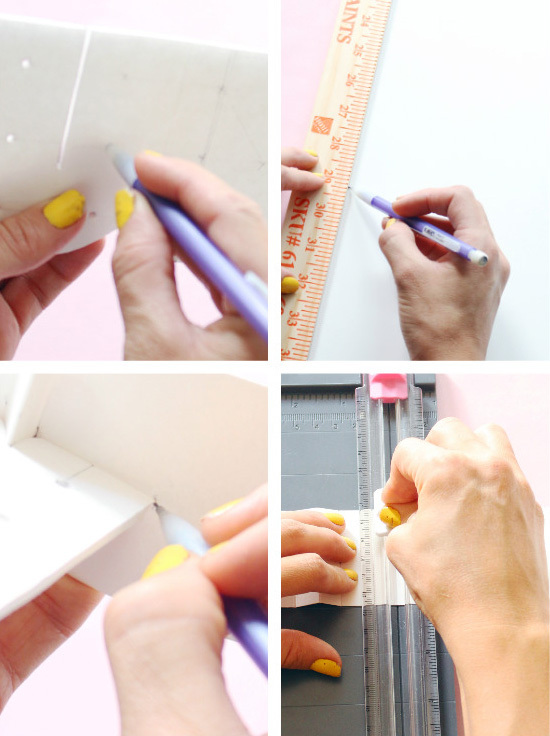 Keep re-fitting it around your work and marking the next fold. 9. 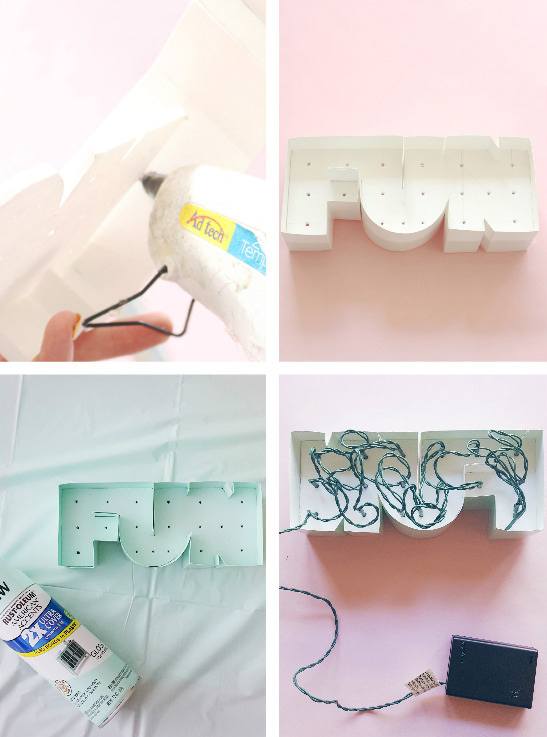 Use a hot glue gun to adhere your strips to your word. Use only a little at a time so it doesn’t ooze out, it’s pretty noticeable once it’s painted! 10. Once your all done outlining your letter, spray paint it with several coats of your chosen color. I used Rustoleum Ocean Mist. 11. Poke your lights through your holes until they just poke through and no wire shows from the front. 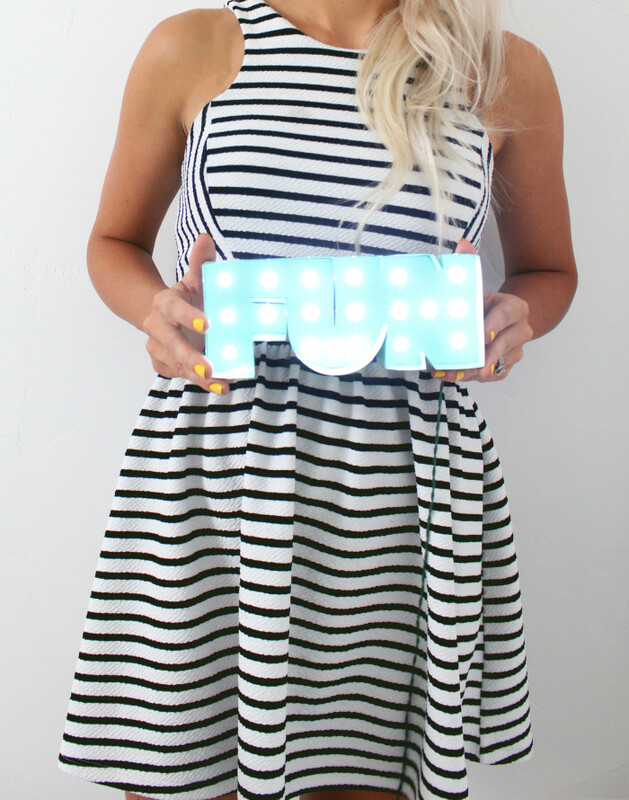 Place on your workspace or use at a party or just wherever you want some FUN! I think a similar DIY for Halloween or Christmas might be in my near future! And I hope one for your desk is in yours! This is so ‘fun’ ;). It looks so cute, I love it! looks adorable can’t wait to try it out! it looks adorable can’t wait to try it out!